Pets are a great addition to any household. They provide their owners with endless loyalty, love, and entertainment. Perhaps the only downside of having pets is cleaning up after them. Most pet owners would say that the job is worth it though. A little carpet cleaning knowledge on the best ways to deal with pet mess can make the process even easier. Imagine your dog tracked in mud from outside. The first step is probably to get the dog’s paws cleaned up as soon as possible before your entire carpet is covered in prints. 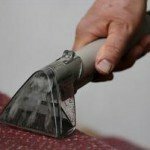 There many carpet cleaning products on the market, but chances are you might not even need to fork out for them. Often some hot water, clean towels, a bristle brush, and some mild detergent will do the trick. Remove as much of the excess mud as you can before adding any water to the soiled area. Make a solution with warm water and powdered detergent. Apply the formula to the dirty areas with the bristle brush. Let the formula do its thing for about fifteen minutes, and then dry the area by dabbing with a clean towel. While these carpet cleaning tricks are good for small areas, there will come a time where you’ll want to do a thorough clean of the entire carpet in each room. The best solution in this case is to call in a cleaning company that specialises in carpet cleaning London. Carpet cleaners use the most powerful cleaning equipment and non-harmful products available in the industry. They can remove every last stain left by your pets as well as other pollutants that have made their way into your carpet. For carpet cleaning Ilford call our cleaning company on 020 3907 7263 to receive a free quotation.